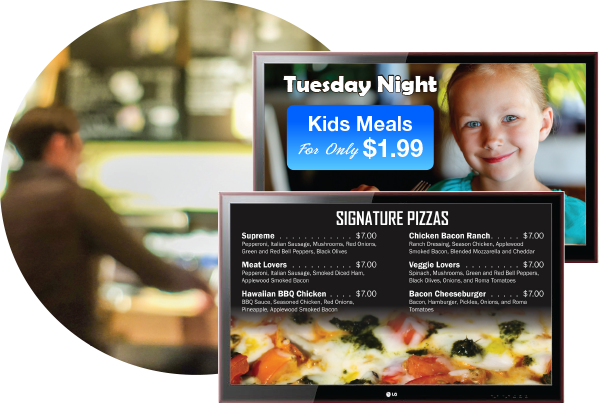 Display your menu, specials or other types of advertisements on your in-store TV monitors. Your monitors can change what they display at different times of the day, they can show intermittent pop up ads, they can rotate different content at set intervals, and much more. All of this content is easily controlled with Top Restaurant Solutions admin tool. With our solution your menu and other content is pulled from the same source as our website and online ordering product so when you update your items or pricing your digital menu boards will update automatically. Most TVs these days are smart TVs and many, but not all have a built-in web browser. So before you go out and purchase a TV for displaying your digital content please verify that it is Wi-Fi ready and has a built-in web browser. We are more than willing to supply you with a list of TVs that we recommend.